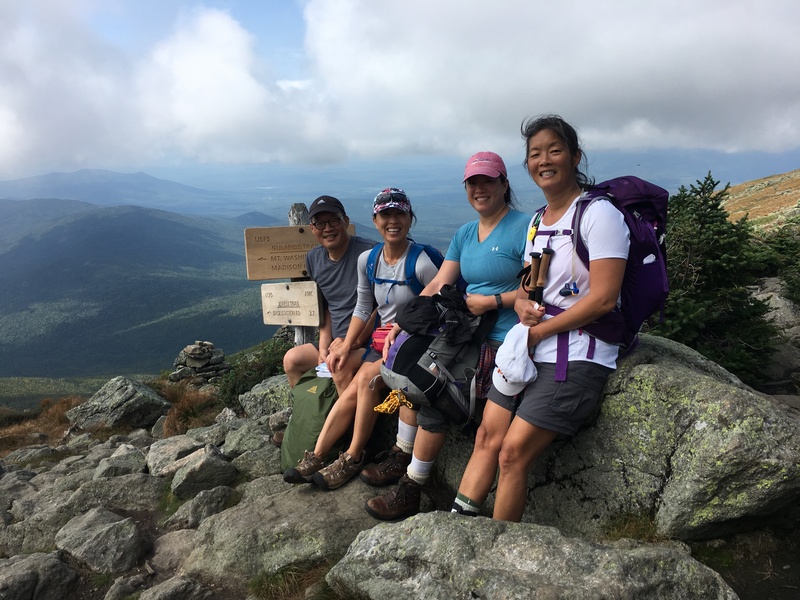 This summer our three chidlren and daughter-in-law hiked the famed Appalachian Trail along the East Coast of the US for three days. 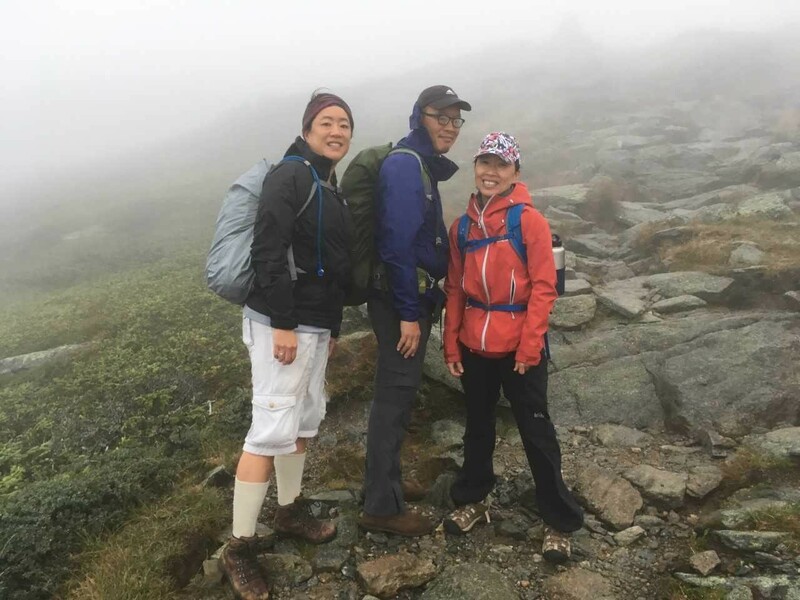 Below is the account fo their advanture at elevations 4000-6000 ft written by my eldest daughter, Christine Ho Kim. The Appalachian Trail (AT) is one of the great hiking trails in the world. Located in the eastern United States, it stretches 2200 miles (3500 km) from the southern state of Georgia to Maine in the northeast. Every year millions of people hike on some portion of the AT and a few hundred of those people hike the entire length! You can hike the AT for free. It is maintained by the combined efforts of the U.S. government and nonprofit organizations and local trail clubs. 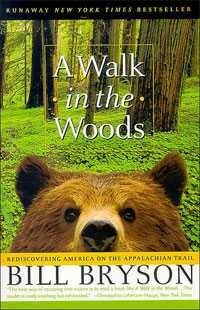 For an entertaining and informative read about hiking the AT, read Bill Bryson’s A Walk in the Woods. 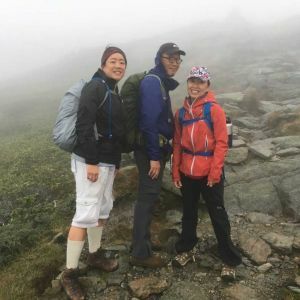 My sister, who has more adventurous travel ideas than most people, proposed last spring that we do a three-day hiking trip on a portion of the AT in New Hampshire. My brother, my sister-in-law, and I eagerly agreed. 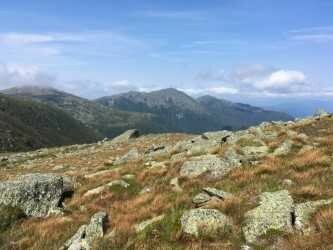 We would hike the “Presidential Range”, a part of the AT which has several summits named after U.S. Presidents. 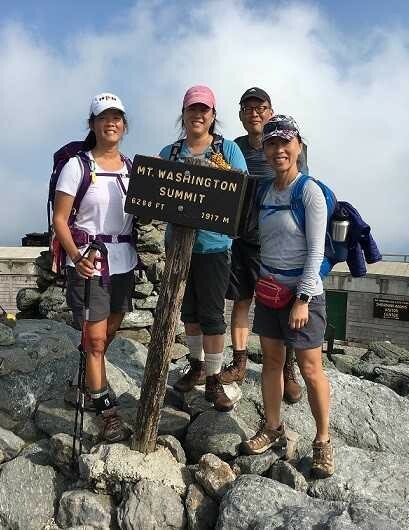 The most famous peak in the Presidential Range is Mount Washington (George Washington = first President of the U.S.); it is the highest mountain in the northeast United States. My sister’s plan was that our first day we would hike up Mt. Madison (James Madison = fourth President of the U.S.). The second day we would hike from Mt. Madison to the summit of Mt. Washington. We would pay to stay in “full-service” huts along the trail. That meant that we could get a bed in the hut and a full dinner and breakfast each day. We would not have to carry tents, sleeping bags, or much food or water. 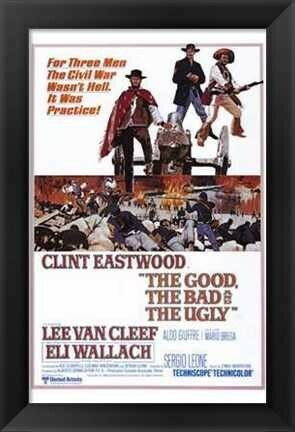 With apologies to Sergio Leone’s classic Western, released 52 years ago, I will recount aspects of our hike. 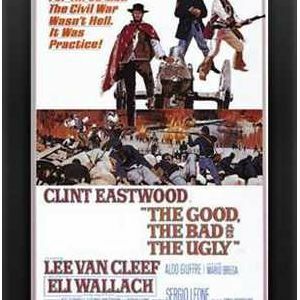 But instead of listing the good, the bad, and the ugly, I’ll go in reverse order. 55-year-old body, not in tip-top shape. Oh boy -- this hike was VERY hard for me! We ascended 4000’ (1200m) the first day and an additional 2000’ (600m) the next. The path was often rocky and uneven. 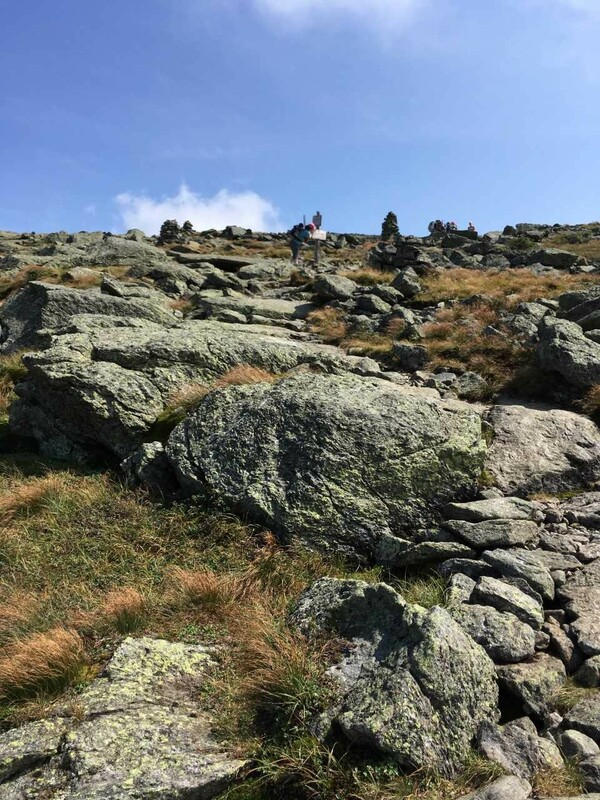 (“New Hampshire is called ‘The Granite State’, you know!” my sister admonished me when I expressed surprise that the trail consisted mostly of rocks.) Oh, to watch the kids who leaped from rock to rock, without concern about breaking a bone or wrenching an ankle! After a full day’s hiking, these kids chatted at dinner and raced around afterwards, whereas I lacked the energy to talk and could barely stay awake through dinner. We also met an 81-year-old man who was hiking with his children and grandchildren. He didn’t leap from rock to rock, but he had more energy than I did. Potential for disaster. Although people regularly die on Mt. Washington and its environs, I have to admit that most of the time I did not feel there was a high risk of death. However, I did feel there was a high risk of some kind of peril, such as a sprained ankle and tremendous discomfort and inconvenience. The path was often wet, windy, and slippery when we were up in the clouds. 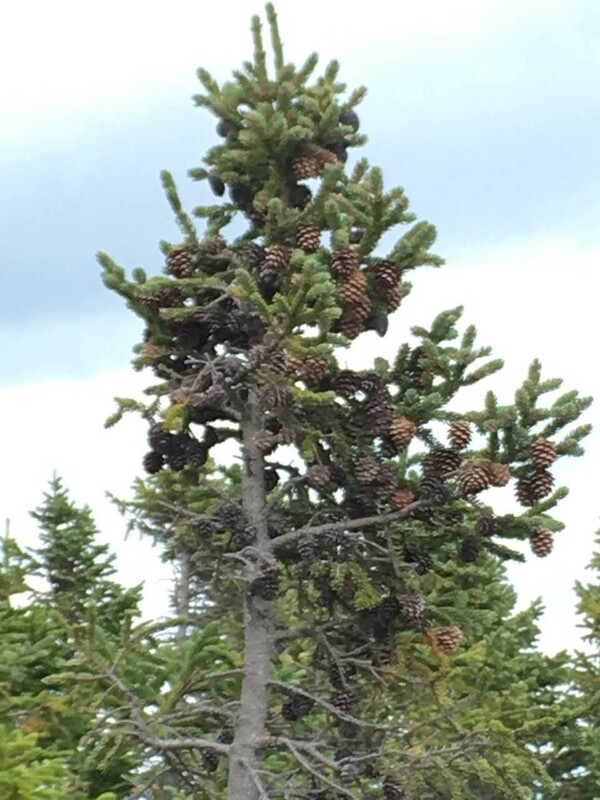 If you twist your ankle and can’t make it to the cabin, you are advised to descend to below tree level and try to take shelter among the trees. But with a wrenched ankle, even going downhill would be difficult. Extreme weather is possible at any time of year on Mt. Washington. The first night in the cabin I heard the howling wind and rain and thought: if you were stuck outside tonight, you’d die. 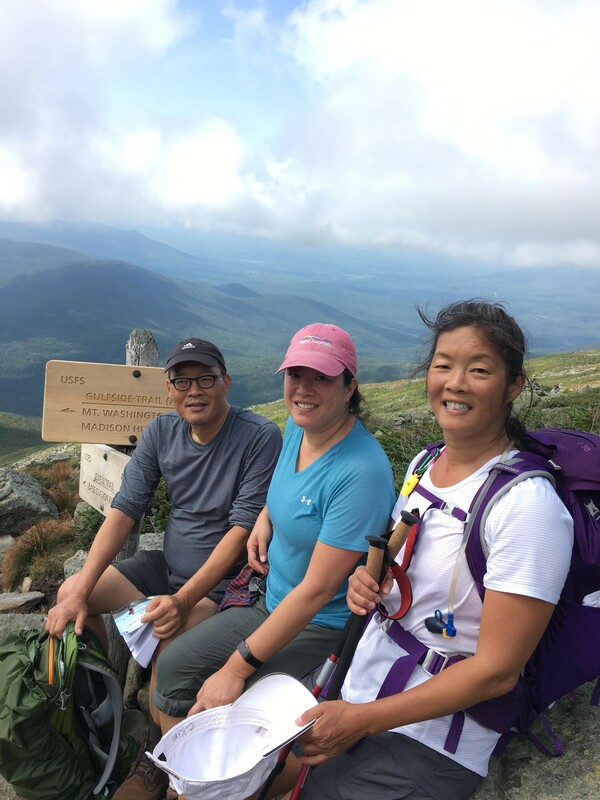 If you hike the Presidential Range – which I wholeheartedly recommend -- TAKE THE WARNINGS SERIOUSLY. Don’t hike alone. Don’t attempt it if you are inexperienced. Carry all the recommended emergency items, such as ample water, rain gear, a fleece jacket (yes, even in the hottest part of summer), a knife, a whistle, and an emergency blanket. There is a poster at the Mt. 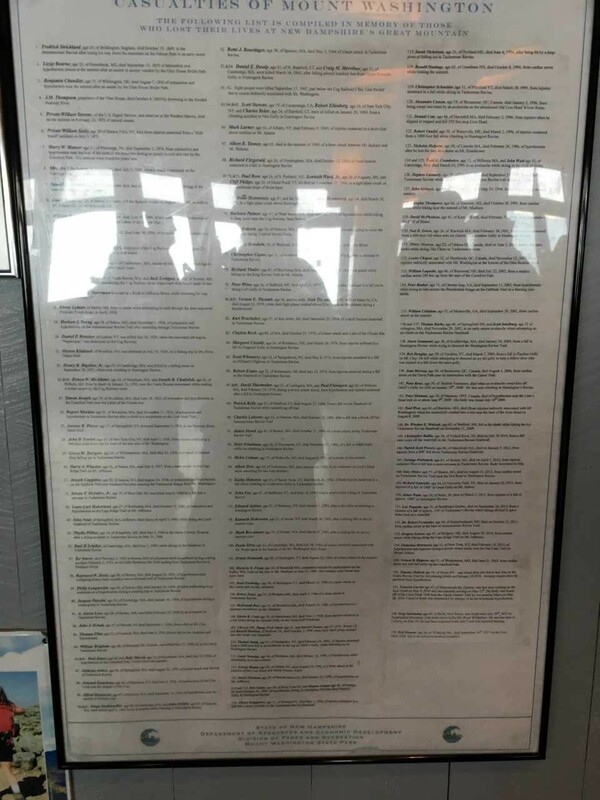 Washington summit which lists all the people known to have died hiking on or near the mountain since 1849. Someone has died almost every year. Sweating a lot each day and no showers at end of day. Every day I was sticky and dirty. Fortunately, I was so exhausted each night I fell asleep easily, undisturbed by sleeping in sticky clothes. The huts and staff. The huts are sturdy, comfortable shelters with cold running water and compost toilets. They are powered by solar, wind, propane, and relentlessly cheerful young workers who think nothing of hiking up and down the mountain regularly for supplies. The staffers sing songs, perform skits, give weather reports, answer questions, and cook hearty meals for the hikers who rest their weary bodies there. Practicing perseverance. Anyone who has hiked, run, or pedaled a bike uphill can relate to this: you struggle to get to the crest of a hill, only to see when you reach the top that’s it’s not really the top. There’s always another hill to crush your spirit. The only way I could make it to the summit of Mt. Washington was to put my head down, refrain from looking uphill, and focus on placing one foot down after the other. As long as I keep walking I’ll reach the top, I told myself. Taking pleasure in natural beauty. For two days I did not look at my phone; I did not read emails or send texts; I did not waste hours playing online solitaire. I hiked and ate and fell asleep easily every night. I saw endless numbers of gorgeous trees, shrubs, grasses, flowers, rocks, lichen, and more. Although I believe it’s a citizen’s duty to remain engaged with current events, it is also good to take breaks. Spending time with siblings/in-law. Best part of the trip. As we struggled on the mountain we grimly swore that my sister would never be allowed to plan another trip for us. But in truth it was a wonderful idea, if difficult. We hiked, we helped each other on the trail, and we reached the summit together. Best of all, we have this experience and we can reminisce about for it years to come. Each year when we talk about the trip, the mountain will get higher, the weather more extreme, and the perils more threatening. Maybe we’ll even throw in a dramatic rescue or two that never happened. It’ll be great. There is plenty of information about the Appalachian Trial online. For one good source, visit the Appalachian Mountain Club website at www.outdoors.org. If you are not comfortable planning your own hike, you can sign up for one of their guided hikes. In the old days, teachers would typically make students write an essay titled “What I Did This Summer” when school began each September. Some portions of the AT charge a fee for camping or staying in huts.